ESA’s second Automated Transfer Vehicle, was launched today evening from Europe’s Spaceport in Kourou, in French Guiana, at 22:50:55 CET by an Ariane 5 to deliver critical supplies and reboost the International Space Station. It is due to dock on Feb. 24. A massive European cargo ship soared into the evening sky off the northeast coast of South America today, kicking off a weeklong trip to deliver tons of supplies to the International Space Station. The unmanned spacecraft, called the Automated Transfer Vehicle 2, blasted off atop Europe's workhorse Ariane 5 rocket from the Guiana Space Center in Kourou, French Guiana, at 4:50 p.m. EST (2150 GMT) after a one-day delay due to a technical glitch. Built for the European Space Agency, the ATV-2 weighs in at more than 22 tons (about 20,000 kilograms), making it the heaviest European robotic spacecraft ever launched into space. It beat out its predecessor, the ATV-1 spacecraft, by about a ton, ESA officials said. ESA officials christened the spacecraft the ATV-2 Johannes Kepler, after the famed German astronomer and mathematician who lived in the 16th and 17th centuries. It is packed with about 7.1 tons (6,400 kilograms) of supplies for the space station's six-person crew and is due to arrive at the orbiting laboratory Feb. 24. The flawless liftoff was the 200th launch for the Ariane rocket family, which is managed by the European launch service provider Arianespace. 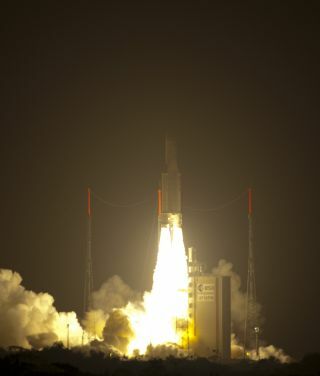 "This launch was exceptional," Arianespace CEO Jean-Yves Le Gall said. ESA Director General Jean-Jacques Dordain also lauded the launch and said even the International Space Station's six occupants were able to see the Ariane 5 rocket lift the Johannes Kepler into space. "They have seen the launcher from the space station and they have taken pictures," Dordain said. The space station crew also completed a nearly five-hour spacewalk today to install new science gear to monitor earthquakes and storms from space. Arianespace attributed the delay in the ATV-2 launch to "a measurement anomaly" in the rocket's liquid oxygen tank. That 24-hour slip has prompted NASA to consider a possible delay of its own for the upcoming space shuttle Discoveryflight to the space station,due to space traffic concerns. Discovery is currently slated to launch from NASA's Kennedy Space Center in Florida Feb. 24. That would have been one day after the ATV-2 spacecraft arrived at the space station, but now both events will be occurring on the same day. NASA officials suggested today they might put off the launch for Discovery's STS-133 mission for a day, to restore the buffer between the shuttle launch and ATV-2 docking, but they later said Discovery may stick with its initial launch day and time. "STS-133 launch will not necessarily slip as previously thought," officials at the Kennedy Space Center announced via Twitter. A final decision will be made by top NASA shuttle program managers on Friday (Feb. 18). Discovery's STS-133 mission is an 11-day flight to deliver a humanoid robot and a new storage room to the International Space Station. The mission already has been delayed months by fuel tank problems. It will be the final flight of shuttle Discovery before NASA retires its three-shuttle fleet later this year. The Johannes Kepler is ESA's largest cargo delivery mission yet to the space station. The cylindrical spacecraft is 35 feet (10.7 meters) long and 14.7 feet (4.5 meters) wide. "It's exactly the size of a double-decker bus in London," said ESA astronaut Jean-François Clervoy, who helped designed the interfaces that astronauts will use to unpack cargo inside the spacecraft. ATV spacecraft are designed to fly to the International Space Station, dock themselves at the aft end of the station's Russian segment and spend about six months attached to the orbiting lab before being discarded to burn up in Earth's atmosphere. As its name suggests, the ATV-2 is the second of at least five spacecraft the ESA plans to use for cargo runs to the space station. The first ATV, called the Jules Verne, flew itself to the space station in March 2008 and was discarded later that year. The cargo in the unmanned spacecraft is expected to typically include about 6 tons of supplies. ATV-2 Johannes Kepler beats that average by just over a ton. Arianespace and ESA officials have said upgrades to the Ariane 5 rocket allow the extra payload. Altogether, the Johannes Kepler weighs 44,202 pounds (20,050 kg), Arianespace officials have said. Europe's ATV spacecraft are part an international fleet of robotic ships that ferry cargo to the space station. Russia's unmanned Progress vehicles and Japan's cargo ships, known as H-2 Transfer Vehicles, also provide shipments to the station. In the last month, all three spacecraft have launched toward the space station. Once NASA's shuttle fleet retires, the U.S. agency plans to rely on its Russian, Japanese and European partners to provide cargo and crew transportation to the station until new commercial American spacecraft become available. In the meantime, ESA officials said they are looking forward to next week's planned ATV-2 docking at the space station. "This is a first step for ATV," Dordain said of the launch, adding that the mission still has a half-year to go. "We are far from declaring it a success … Success will be declared six months from now." The next ATV to fly will be the ATV-3 Edoardo Amaldi, named after the Italian physicist who died in 1989. It is scheduled to launch in 2012.